In this design, I-90 travel lanes will be rebuilt at-grade and travel lanes for a section of Soldiers Field Road will be built on a new viaduct, while accommodating potential future pedestrian and bicycle lanes. Stephanie Pollack, Massachusetts Department of Transportation (MassDOT) secretary and CEO, announced she has selected the "Highway At-Grade Hybrid With Elevated Soldiers Field Road" preferred alternative design for the Allston Multimodal Project when the replacement of the I-90 Allston Viaduct begins. In this design, I-90 travel lanes will be rebuilt at-grade and travel lanes for a section of Soldiers Field Road will be built on a new viaduct, while accommodating potential future pedestrian and bicycle lanes. Pollack also has directed the Allston Multimodal Project team to begin to develop a Final Environmental Impact report for the project based on the design and to re-assess the phasing of the project. "After evaluating the extraordinary recent work of the Independent Review Team, studying the idea to place all transportation elements at-grade, considering other hybrid proposals, and weighing valuable stakeholder and public input, I have selected the Highway At-Grade Hybrid With Elevated Soldiers Field Road Preferred Alternative for the so-called ‘throat' portion of the project," said Pollack. "While every proposed design has its advantages and disadvantages, I believe this Hybrid can be permitted expeditiously, best balances the present-day and future mobility needs of all users, and protects and enhances as best as possible the natural and historic resources and public realm of the Charles River Basin and neighboring Allston community." MassDOT has been conducting an independent review of the "throat" portion of the project, which is the relatively narrow area at the eastern end of the larger Allston Multimodal Project site. The throat area is bordered to the north by the Charles River, to the south by the Boston University (BU) campus, to the east by the BU and Commonwealth Avenue bridges, and to the west by Harry Agganis Way. "MassDOT's preferred design is a significant improvement; by building the highway at-grade, we have the opportunity to provide more open space and improved paths, new connections between the neighborhood and the Charles River, and a better experience for everyone who uses this essential corridor," said Chris Osgood, city of Boston chief of streets. "We want to commend MassDOT for the collaborative process that they have led, and thank the many constituents whose voices helped strengthen this plan. We look forward to the continued collaboration on this project." "The decision to build the new highway at-grade announced by Secretary Pollack is a collective victory for state and municipal officials, consultants, key business and institutional leaders, the local community and advocacy groups", said Richard A. Dimino, president and CEO of A Better City. "The new at-grade highway will widen and enhance the river parklands, improve pedestrian and bicycle connectivity across the corridor, and greatly improve the surrounding environment in abutting neighborhoods. A Better City appreciates all of the hard work MassDOT has undertaken to evaluate the various designs." The written decision issued today stressed that, "A project of this scale and complexity involves trade-offs and will require compromise." Pollack noted particularly that the Hybrid option was chosen "despite the fact that it requires a long and complicated construction period that will disrupt travelers, whether they are in cars or trucks, on commuter rail, or walking or cycling on the Paul Dudley White Path." The decision noted, however, "MassDOT should place more weight on the final condition of the infrastructure than on the construction-period duration and challenges. MassDOT will work to manage the construction period challenges as best as possible." 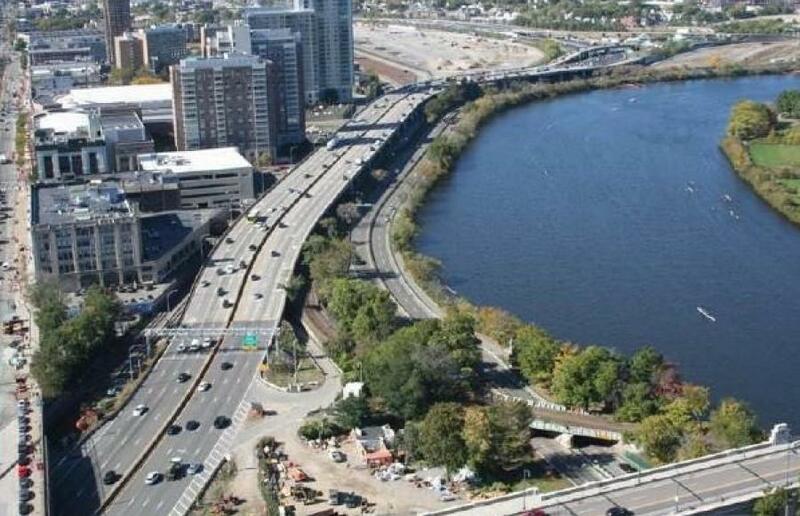 While the idea of putting the entire project on the ground or "at grade," with no viaduct, was strongly considered, that option was eliminated from further consideration because, as explained in the decision, "It would require extending transportation infrastructure right up to the bank of the Charles River and likely into the river itself, making it very challenging if not impossible to permit and creating unacceptable impacts on the water, parkland and historic resources of the Charles River Basin." Another key issue for the Allston Multimodal Project addressed by the decision is when a new commuter rail station, West Station, could be built. The decision explains that, "The ultimate in-service date for West Station will depend on service and scheduling decisions that will be made by the MBTA" in the future. Pollack does instruct the MassDOT Allston team "to work closely with MBTA Railroad Operations to determine whether or not West Station construction could begin while the Allston Multimodal Project is being completed and what the earliest feasible opening date could be." Pollack is now directing the project team to begin to refine logistical features of the Highway At-Grade Hybrid With Elevated Soldiers Field Road design, including choosing the exact location of the new viaduct which will carry lanes of travel for Soldiers Field Road. MassDOT also must consider a number of key issues, including lessening impacts on the Commuter Rail System due to closing Grand Junction Railroad, (as railroad infrastructure will need to be moved), so as to try to reduce or mitigate the number and duration of closures and outages, revisiting and redoing the construction phasing and sequencing concepts included in the Draft Environmental Impact Report to attempt to shorten the overall construction duration and potentially accelerate the construction of West Station and working with utility owners to devise the best and most efficient plan for relocation. The project team's timetable going forward will include the filing of the FEIR by the end of 2019. It is anticipated that procurement of a design-build construction contractor will occur in late 2020. Construction of the Highway At-Grade Hybrid With Elevated Soldiers Field Road design may take approximately eight years. For more information, visit mass.gov/allston-multimodal-project.